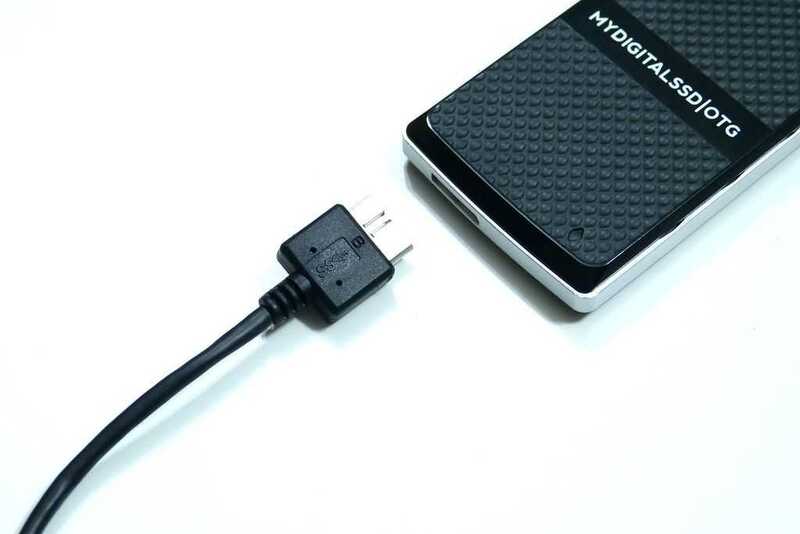 The MyDigitalSSD OTG is a special kind of USB drive. It’s not only small and light but it’s the fastest ‘USB’ drive we’ve ever tested. How does 381MB/s sound? OK, it’s not exactly a standard USB flash drive because inside this pocket rocket is a ‘real’ SSD and controller. The USB3.0 interface ensures that it can reach those high speeds. Not only is it fast but it’s light, silent, relatively rugged and requires no external power, even on the small 8-inch Windows tablets. It also appears as a ‘drive’ rather than removable USB storage so you can do a lot more with it in terms of partitioning and booting. In this test we’ve done some speed tests using a fast USB3.0 and SSD Ultrabook, the same using the Toshiba Encore WT8 8-inch Windows 8.1 tablet over USB2.0 and then we tested it as a restore, image, archiving and storage drive. SSD, OTG, Drive, SCSI, Light, rugged, 240GB, No external power, silent and fast. 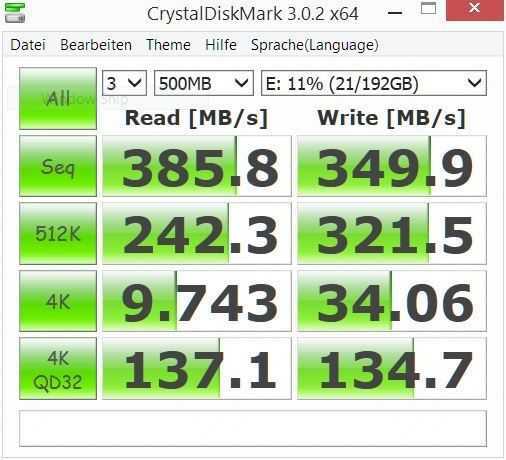 The MyDigitalSSD drive was partitioned by us as below. 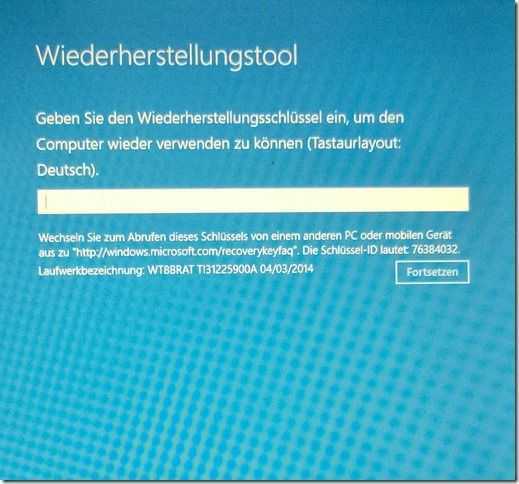 The Recovery partition was created during a Windows 8 recovery drive creation process. Test were performed on the second partition. 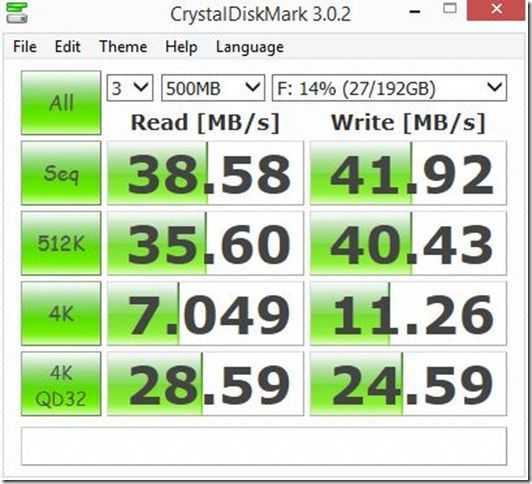 The test Ultrabook has a Core i5 Haswell CPU, fast SSD (Intel M.2. 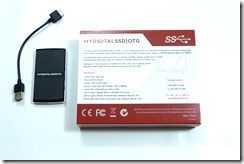 SATA) storage, USB3.0 interface. 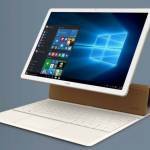 The Toshiba Encore WT8 Windows 8.1 tablet has USB2.0 and eMMC memory with a maximum speed of around 100MB/s and could form a bottleneck with the USB2.0 limitations. Clearly the OTG drive works best on a USB3.0-capable system but the write speeds on the Baytrail-T system are up there with the internal drive speeds. In a file copy test the transfer rate was a steady 124MB/S. In a file copy test the transfer rate was a steady 11MB/S. Hard Drive, Not USB Flash. 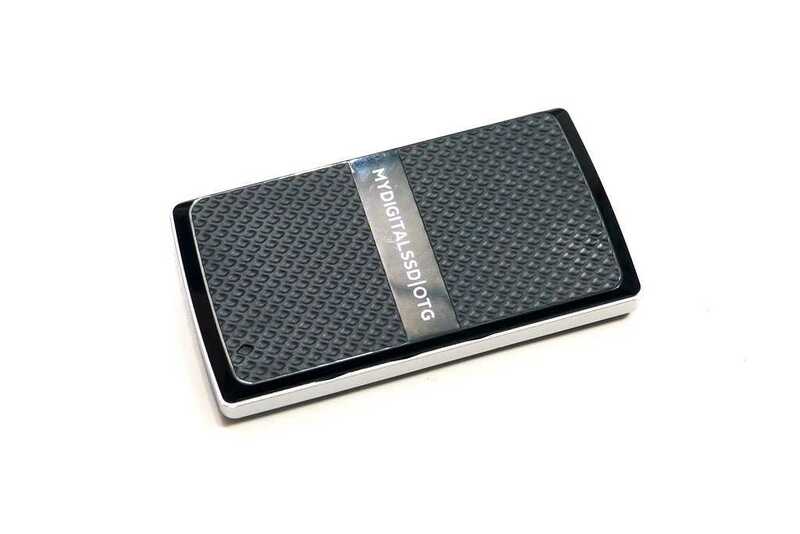 MyDigitalSSD have a second line of USB3.0 SSDs in the PocketVault range. They’re cheaper and slower, which matches the requirements for simple file storage quite well. What they don’t offer though is the ‘drive’ feature of the OTG rage. PocketVault products are removable ‘mass storage devices’ which means Windows 8 treats them oike USB flash drives. You can’t partition them just as you can’t partition a USB stick without performing some tricks. 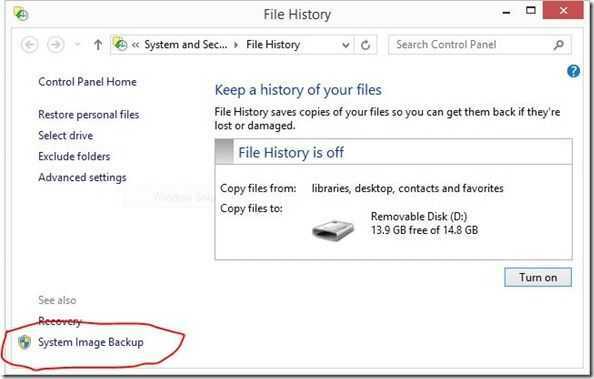 Windows also won’t let you write a disk image to a USB drive, even it’s as big and fast as the PocketVaults. The OTG drive is different. 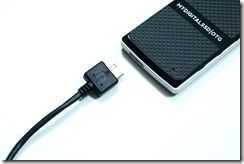 It acts as an external SCSI drive and as such can be partitioned and used in ways that a USB flash drive can’t. 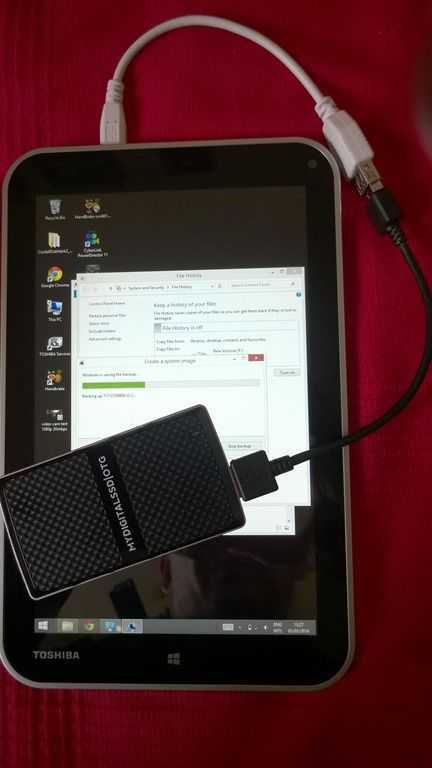 Using the MyDigitalSSD OTG as a Windows Tablet boot, image, archive and storage drive. 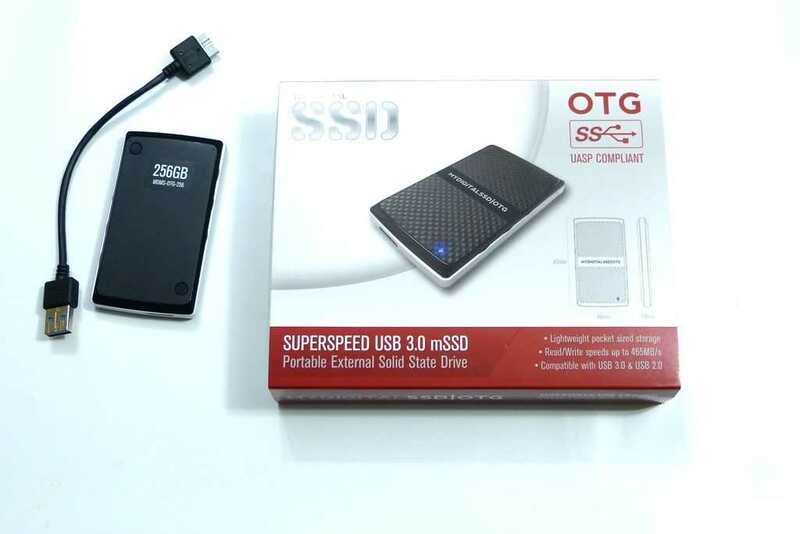 In this test we wanted to see if the OTG could be used for three important functions in Windows 8 disk and file management. 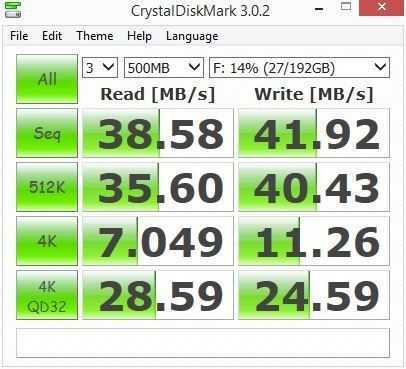 Given that many of the low-cost Windows 8.1 tablets only have small 32 or 64GB internal drives there are good reasons why you might want to use an external drive as the recovery partition. Saving a full disk image and acting as the File History destination is also possible. Here’s how we tested it. 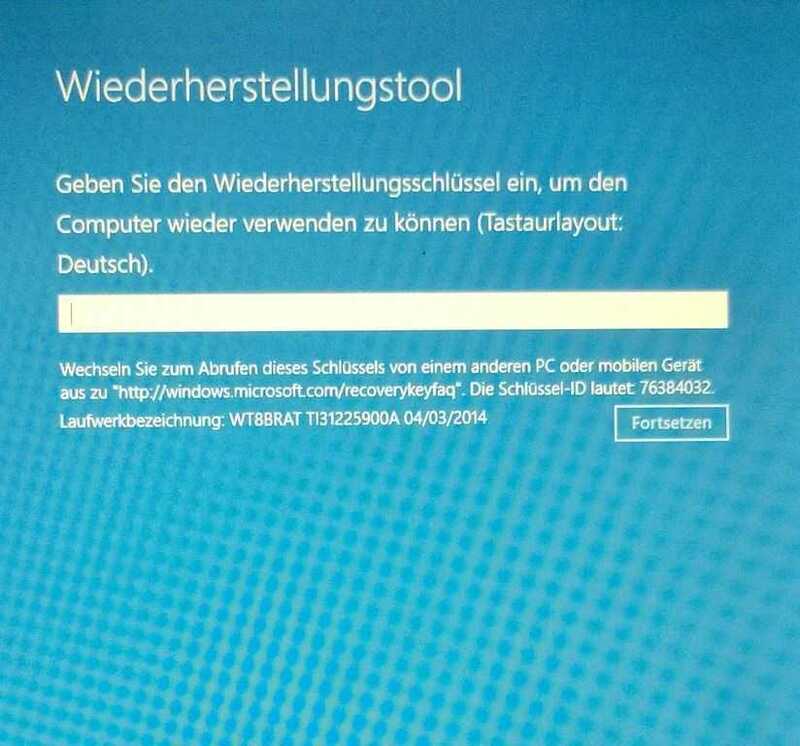 First we used the Windows 8 ‘Create a recovery drive’ function which created a 32GB FAT partition, installed the boot files and added the recovery partition allowing a Windows 8 tablet to be booted and repaired or even returned to factory build. After the recovery drive was complete we used the Windows 8 disk manager to create an NTFS partition in the remaining space. 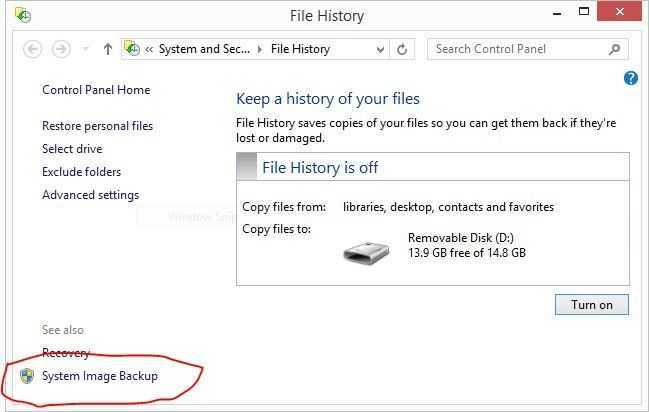 Once the system has scanned for drives (which takes a few seconds) you’ll see the ‘System Image Backup’ option in the bottom left. 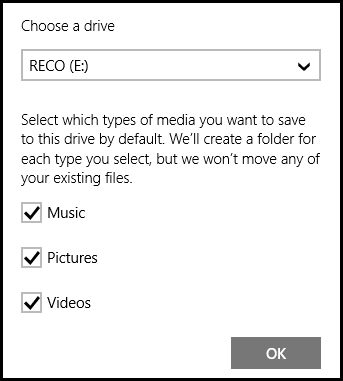 Select that and you’ll be prompted to choose an external drive (choose the new NTFS partition on the external SSD) and you can create an image. Image creation took us about 10 minutes. In this window you can also turn on File History which archives your personal files against date. This is more than just backup, there’s an element of file versioning with this service. 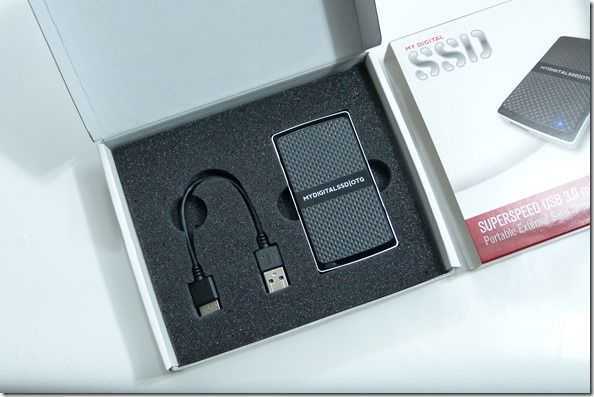 Select the USB SSD and Windows 8 will start to copy personal files across. You can remove the drive and insert it whenever you want to get an updated snapshot of your files. A drive can be used for multiple devices and can be shared over the Homegroup as a recommended File History drive. (Note you’ll need to keep the tablet powered and the screen on if you want this storage to be continuously usable.) As a NAS the Toshiba WT8 was registering under 3W of power usage (low screen brightness) which is incredibly energy efficient. At this stage we had a recovery disk, a full disk image, personal file archiving and 170GB of storage space, all running on a lightweight external SSD that requires no additional power. We tested a full disk restore and it worked without any problems in about 15 minutes. In the image below you can see the key request for the encrypted drive we had on our WT8. Note that if you use full disk file encryption on your Windows 8 tablet the files copied externaly, including the disk image, are not encrypted on the USB drive. When you perform any of these operations make sure you have a good level of battery (20% or more) because in many cases the Windows 8.1 tablets only charge over the same USB port being used for the drive! We haven’t deleted the recovery partition on our Toshiba WT8 as part of this test yet but are planning to do that for a separate article. Update: We have now tested this and it worked without any issues. Video coming soon. 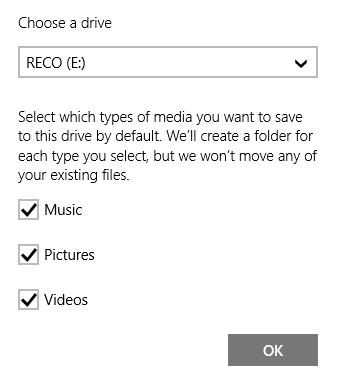 Note that under Windows 8.1 you can set the OTG to be the default place to store videos, images and music. Given the speed of this drive there would be no problem using it as a USB-bootable OS. Windows To Go has not been tested and we don’t see any certification for that but it should be possible. Linux run-from-USB builds should also run well on this product. 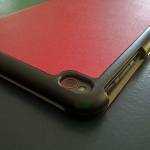 Build quality and design is rather unappealing. Hard plastic is used all over but it does feel solid. A blue activity light shows then the unit is being accessed. The USB3.0 adaptor cable is around 6-inches long. We used a USB3.0 to micro USB adaptor to attach the drive to our Windows 8.1 tablet test device. The unit was supplied by MyDigitalSSD for review so we haven’t had to put down our hard earned money on this but at $169.99 for the 256 GB version on Amazon.com it’s clearly very well priced. A 128GB version is $99.99 and the 64GB version is $64.99. 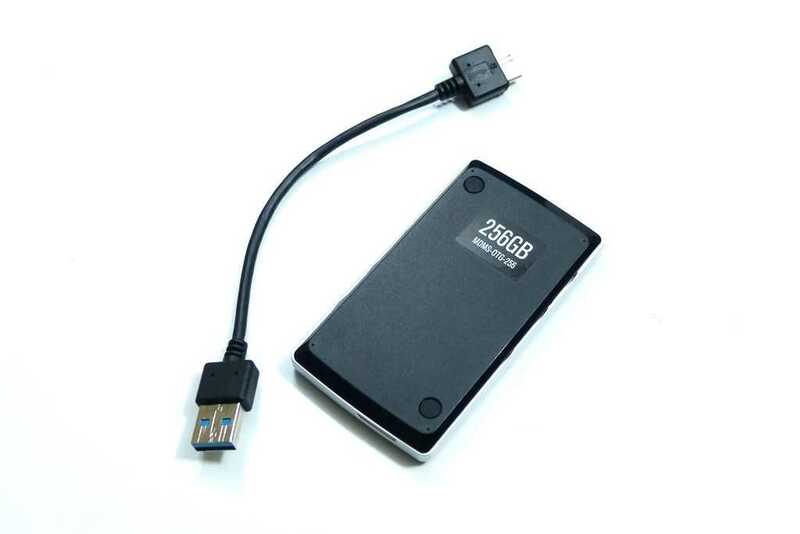 We’ve reviewed the MyDigitalSSD here through speed tests but also as a Windows 8.1 tablet companion because of its light weight, ability to run without additional power and ‘drive’ capability but clearly, given the high speeds, this would also make a perfect companion storage device for an SSD-based Ultrabook as a recovery drive, file archiving drive and additional storage space. 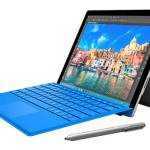 The device could have been made a lot more attractive and we’d love to see it shipped with a Micro-USB adaptor for all the new Windows 8.1 tablets but given the pricing and features we think we can handle these two issues. 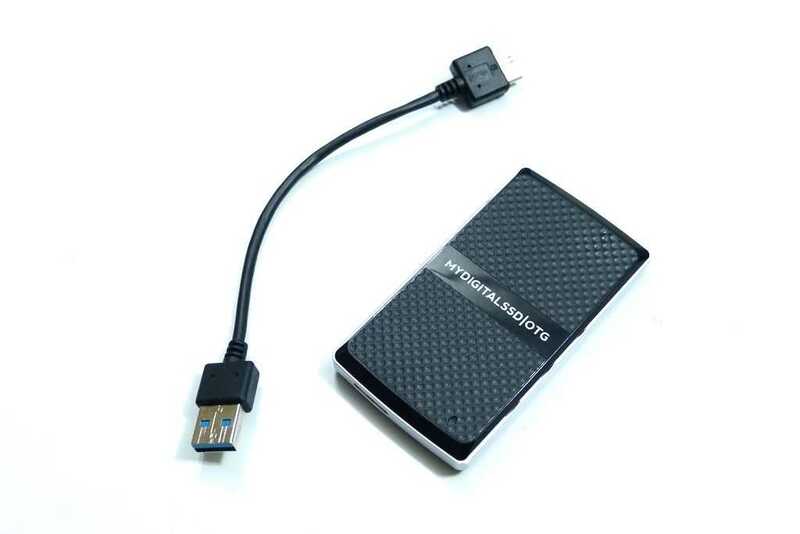 MyDigitalSSD have a very useful mobile storage product in the OTG. It’s nice but I’d rather use an SDXC card for a UMPC. For me, as devices shrink, things dangling off it gets a lot more awkward. Of course, if these UMPCs had enough storage I wouldn’t use external storage as much. Eh did you actually read the review? This thing can run your system at speeds that are unheard of by booting from it via USB 3.0. Of course if you are only looking for storage an don’t care about speed an SD card will work. Dude, did you read the name of this site? You like that thing hanging off your UMPC constantly? I wouldn’t. That photo says it all. It’s still not for mobile use. It’s mostly tied to desk use. Maybe I’ll carry one in a laptop bag but, then again, if I’m carrying a laptop and bag, I’d just opt for something else. I don’t know about this device. I went to MyDigitalSSD’s site and it’s very amateurish looking. Product pages are just one long page and just generally looks like a soneone’s first attempt at making a site. Makes you wonder about the products themselves. 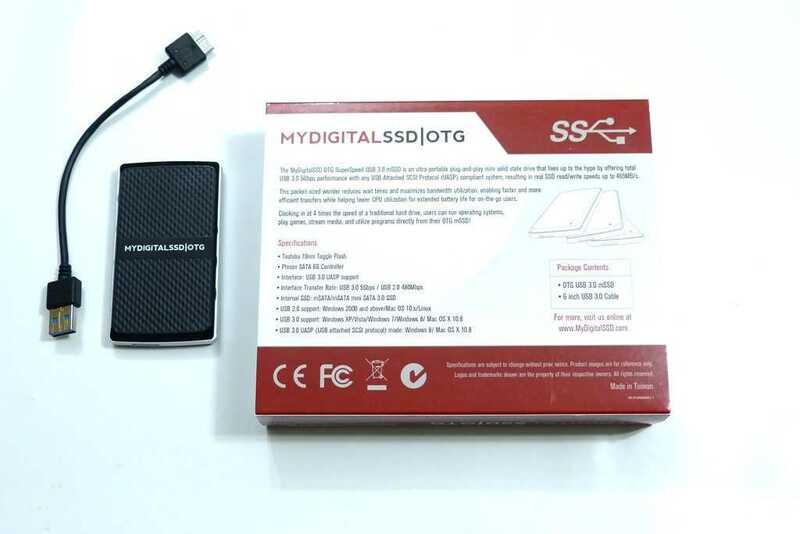 Just to update you – I’ve done some work with MydigitalSSD over a number of years and in my experience they’re a solid company with solid, leading-edge products. Sorry it took so long to reply to this – I spotted it as i’ve been preparing for the arrival of a few more products form the company! « Broadwell Ultrabooks in Q4 2014. Expect these Features.